Brett Leonard's The Lawnmower Man was part of an interesting era in cinema, a moment in history that changed the way we watch movies forever. Love it or hate it — or more like, mostly forgotten — the low-budget production has made a lasting impact essentially because of the era in which it was made. Basically, the early 90s was the dawn of computer generated images (CGI) — when visual special effects created digitally by 1s and 0s was quickly becoming commonplace. However, the technology was still in its early stages and in some cases, looked laughably phony. So, whereas other films like James Cameron's Terminator 2: Judgment Day and Steven Spielberg's Jurassic Park were more selective on their use of CGI, Leonard embraced it with wide open arms, even going so far as to make it the star attraction. Sadly, and unlike the movie's aforementioned blockbuster peers, the visuals have not aged well, looking pretty crude and antiquated by comparison and in light of how far the technology has advanced in the last twenty-five years. Thankfully, the rudimentary effects are not really the central point. In retrospect, the plot was surprisingly ahead of its time and the technology just wasn't where it needed to be for it to be more successful. (To be fair, the movie was considered a small box-office hit, given its production cost and it being made by an independent company.) The script, actually an original idea written by Leonard and producer Gimel Everett (more on this below), works better as a cautionary tale of a society breaking from reality as it immerses itself into a virtual reality, slowly growing to prefer it over the generally accepted cruelty and violence of the real world. Right as the worldwide web was about to go public, the movie bafflingly saw online gaming, like Second Life and World of Warcraft, and social media consuming the lives of modern civilization. 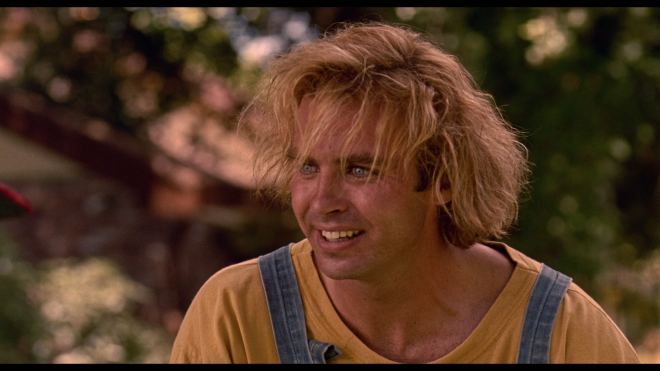 In Lawnmower Man, the gamer is the socially awkward and intellectually disabled landscaper Jobe Smith (Jeff Fahey in a surprisingly good performance), a kind of everyman who seems incapable of realizing his potential and self-worth. Then again, no one else in his sleepy New England town values him much either, being met with as much as cruelty and bullying from residents as compassion and friendly smiles. But even those most sympathetic towards him, from his employer Terry (Geoffrey Lewis) and a local boy (Austin O'Brien), treat him as nothing more than a gullible man-child. The only person who sees something more in Jobe is Dr. Lawrence Angelo (Pierce Brosnan), a scientist working for the mysterious Virtual Space Industries. Then again, the motivation behind his goodwill is to simply use Jobe as a guinea pig for his experiments, which inadvertently unlock a deep-rooted power that drastically evolves his intelligence. This is where the movie suddenly turns into a bizarre horror tale with Jobe using his new skills for vengeance, lacking the ability to restrain his rapid brain growth with experience and wisdom. Leonard, on the other hand, noticeably holds back from everything completely spiraling into cliched rubbish with the kills carrying some weird significance. Particularly interesting is the death of Father Francis McKeen (Jeremy Slate), making the plot's many religious themes all the more apparent, such as Jobe acting as a darkly twisted Christ figure and his name pronounced like the Biblical hero Job. Except in this hellish version, Jobe succumbs to temptation, forsakens God and ultimately believes himself greater. 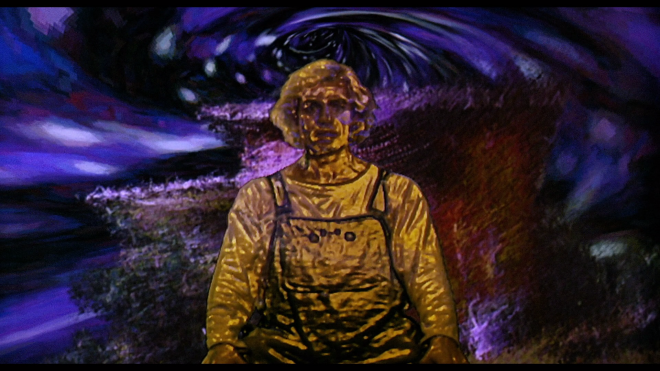 None of this is meant to defend Leonard's The Lawnmower Man as some profoundly insightful sci-fi horror masterpiece, but simply to point out the aspirations of the filmmakers, a project that could serve as a commentary on technology encroaching on our sense of reality. The end result is a curious, mildly intriguing flick with strong performances all around, though much of the dialogue is a bit hokey and the action somewhat hollow. Still, the production was ahead of its time, being one of the first on virtual reality, along with at-the-time ground-breaking computer animation, and one of the first to use motion-capture for the CG sequences. Over the years, the movie has garnered a strong cult following, much of it having to do with this and an unusual plot Leonard was greatly fascinated with it. Three years later, the director went on to helm another virtual reality movie in Virtuosity, starring Denzel Washington and Russell Crowe. Another interesting aspect of the production is that it has nothing to do with Stephen King's short story outside of the title and a character killed by a lawnmower, and Mr. King sued to have his name removed. Nevertheless, the movie remains infamously associated with the author and lives on as a weird cult gem. Shout! 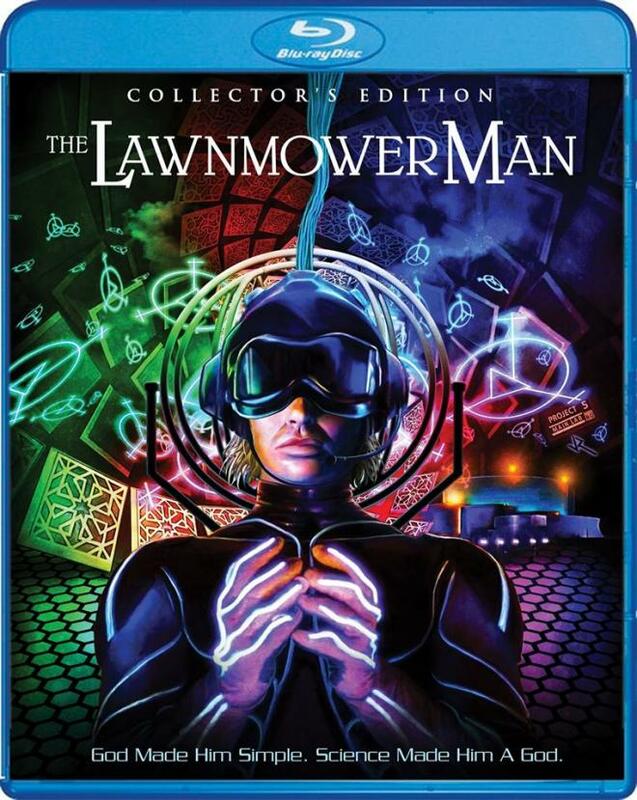 Factory brings The Lawnmower Man to Blu-ray as a two-disc Collector's Edition package under the distributor's Scream Factory line. The two Region A locked, BD50 discs are housed inside a normal blue case on opposing panels with brand new reversible cover art and a cardboard slipcover. The first disc comes with the original 108-minute theatrical cut of the movie with several bonus features. The second disc contains a 141-minute "Director's Cut," which adds 33 minutes of conversations and various interactions between Jobe and other townspeople. The added footage makes Jobe's transformation into a megalomaniac a slower progression, but it's better paced and ultimately feels more genuine. Interestingly, it also makes the character more sympathetic and his metamorphosis as an almost natural response to the abuse he experiences. At startup, the disc goes to a generic main menu selection along the bottom with music and full-motion clips. As of this writing, according to the Shout! Factory website, the exclusive, limited edition poster of the newly commissioned artwork is still available. The cult sci-fi horror flick plugs into Blu-ray with a generally pleasing 1080p/AVC MPEG-4 encode that decidedly surpasses previous home video releases but still comes with a few glaring issues. 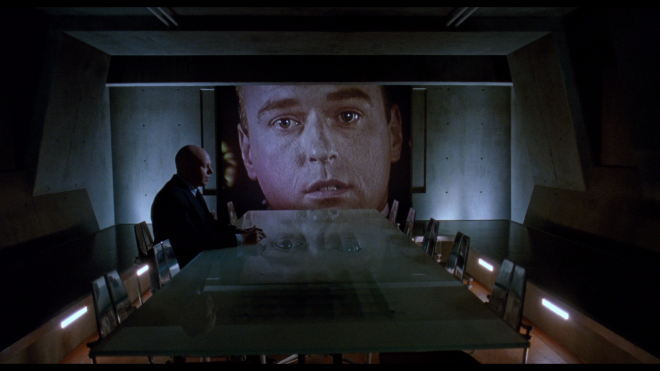 Reportedly, the folks at Shout Factory scanned the interpositive at 4K resolution with additional footage for the "Director's Cut" taken from the original camera negative. On the whole, the results are a fantastic, highly-detailed presentation, but several scenes appear to be in bad shape. Most of these are related to conversations taking place inside Virtual Space Industries or sometimes while in Dr. Angelo's basement where blacks tend to crush the finer details in the darkest portions or grain looks a bit more pronounced. There are also several spots softer than others but thankfully, nothing to really ruin the quality. However, these minor faults are easily excused as the product of the cinematography and the inexpensive film stock used at the time. It's worth noting that it is somewhat easy to spot when new footage has been edited back while watching the "Director's Cut" because the 1.85:1 image does a strange but very brief reframing shift. It's not terribly distracting but noticeable nonetheless. Despite these issues, the overall transfer is in great shape, showing plenty of distinct, sharp lines in the hair of the cast, along with the clothing and furniture of the Angelo household. The tiny, little details in the VR outfits are discrete, and all other items in the background are plainly visible. A spot-on contrast makes the presentation appear fresher and more lively, except for many of those aforementioned poorly-lit interiors. Most apparent are the improved black levels, providing the video with appreciable dimensionality for a majority of the runtime. The palette is also more vibrant and animated than before, providing the early CG work with a bit more pop than in previous home video editions. Flesh tones are mostly accurate and natural, but occasionally, actors appear flushed and pale. Speaking of which, the outdated visual effects not only look more old-fashioned, but I also detected some mild banding in a few spots, which is inherent to the photography and the antiquated CG, not a fault in the transfer. All things considered, the movie has never looked better and fans will be quite pleased with the results. Once again, as is the tradition with most Scream Factory titles, the once-groundbreaking visual effects spectacular finds its true calling on Blu-ray with a pair of DTS-HD MA soundtracks: a 5.1 up-mix and a 2.0 stereo option. The movie was originally recorded in Dolby SR, which lends itself nicely to the new surround sound mix. The mid-range feels more dynamic with excellent clarity in the highs and between the various instruments in the score. The soundstage also maintains outstanding balance and fidelity, as background activity and music providing the movie with a great sense of presence. There isn't much happening in the sides, which is understandable given the source material, but occasionally, a few ambient effects lightly bleed into the other speakers. Likewise, low bass doesn't make much of an impression with only a couple adequate moments, mostly related to the music while leaving action sequence feeling a little lackluster. On the other hand, vocals are clear and precise with exceptional intonation in every conversation. Normally, the lossless stereo option for older movies such as this are the preferred choice, but sadly, in this case, the track comes with an odd echoing effect and the mid-range feels somewhat restrained. It's pretty mild and very subtle, but it's there nonetheless and at times, can be distracting, making the 5.1 mix the better of the two. Audio Commentary: Director and writer Brett Leonard chats with producer and cowriter Gimel Everett about the production, swapping various insights, memories and thoughts. Cybergod: Creating The Lawnmower Man (HD, 51 min): Brand-new documentary features various cast & crew interviews discussing the movie and sharing amusing anecdotes. Vintage Interviews (SD, 5 min): Original EPK with cast & crew interviews. Edited Animated Sequences (SD, 4 min): The CG animation edited together with music. Deleted Scenes (SD, 28 min). Trailers (HD): Original theatrical preview and a TV spot. 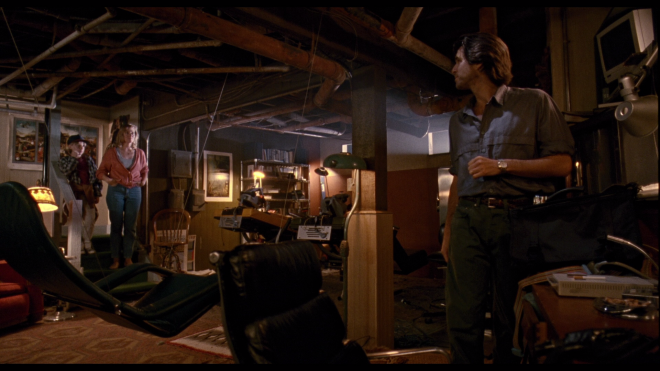 Audio Commentary: Leonard and Everett reunite to share their thoughts on the "Director's Cut" while pointing the various differences. Conceptual Art & Design Sketches (HD, 3 min): A collection of concept art. Still Gallery (HD, 7 min). Storyboard Comparisons (HD, 2 min). 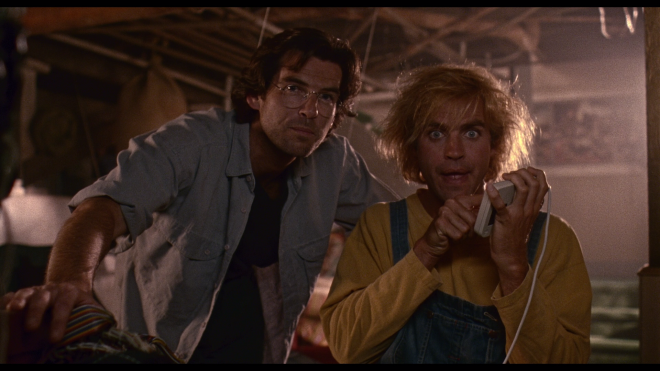 Brett Leonard's The Lawnmower Man may not be a cinematic masterpiece or ever be as well regarded as its peers, but the low-budget production partook in an important period in cinema. While unintentionally ushering in the era of CGI, the story of a socially awkward and intellectually disabled landscaper also serves as a cautionary tale on virtual reality and the internet, and the movie has garnered a loyal following over the last twenty-five years. The Blu-ray arrives with an excellent audio and video presentation that delivers a marked improvement over previous home video editions. With a couple new supplements mixed with the old, the overall package makes for a welcomed addition to the cult library.